With the assistance of our team of professionals, we are engaged in providing an excellent quality Dimple Perforated Sheets. This perforated sheet has endless applications such as enclosures, partitions, sign panels, guards, screens, and more. Our sheets are used for its variety of holes sizes, percentage of open area, high strength-to-weight ratio and aesthetic appeal. Rugged in design and corrosion resistant sheets in varying sizes and shapes are offered by us to meet the variegated requirements of our clients. 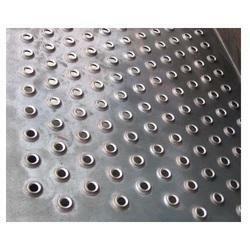 Our organization has gained recognition for providing premium quality Dimple Hole Perforated Sheets. Offered sheets are available in a selection of staggered or straight row patterns in a wide variety of hole sizes, gauges, and materials. 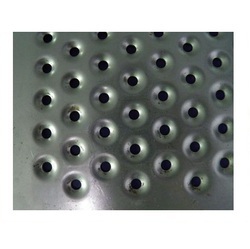 This perforated sheet may be considered an attractive alternative to round holes in some applications. All these perforated sheets are manufactured in different construction materials as required by our clients. Looking for Dimple Perforated Sheets ?